Hormones have a lot to answer for, including one beauty woe we don’t tend to talk about – hair loss and thinning. One of the female hormones, oestrogen, is responsible for keeping hair in its ‘growing’ phase. And when our hormone levels drop around the approach of the menopause, you may notice your hair looks thinner and has less volume. You may even notice hair loss – which can play havoc with your confidence. That’s the time to turn to the Plantur 39 range of shampoos, tonic and conditioners. The two hero shampoos are formulated for either fine, brittle, or coloured and stressed hair. They contain a special Phyto-Caffeine Complex to support healthy hair. This Phyto-Caffeine Complex stays active for up to 24 hours, providing the energy your hair needs, which is why you should use a Plantur 39 shampoo each day. Prefer to wash your hair every other day? 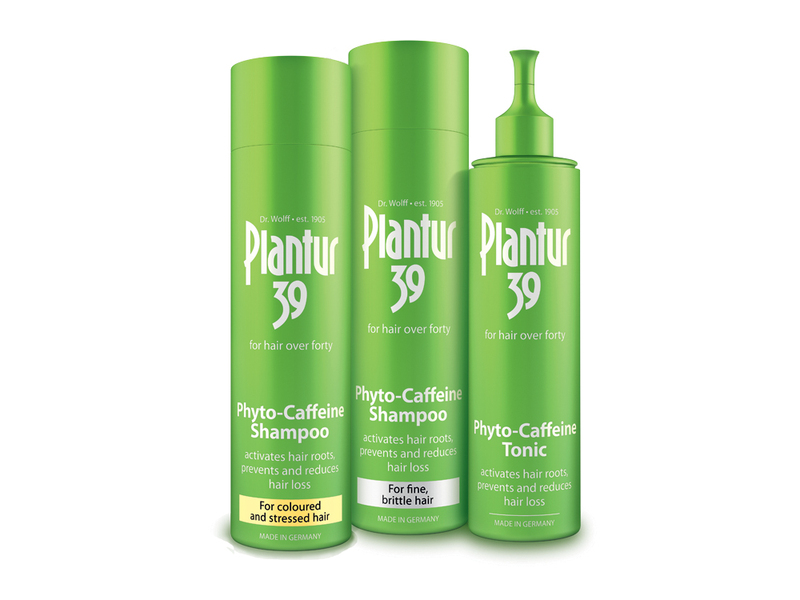 Say hello to Plantur 39 Phyto-Caffeine Tonic, which helps to reduce hair loss and is a perfect match for women who’d rather not wash their hair every day. As well as caffeine, it contains niacin, zinc salts and bioactive substances to support stronger hair. You simply massage it into your scalp and leave without rinsing. The tonic penetrates into the scalp, protecting hair for up to 24 hours. Finally, there are the conditioners – the Plantur 39 Conditioner for fine, brittle hair and the Plantur 39 Conditioner for coloured and stressed hair – both of which contain a buffer that protects the active ingredients in the shampoos from being rinsed out. All this support, plus beautiful shine and condition… we love this range! For more information, visit plantur39.co.uk. You can buy the range of Plantur 39 products at Boots, leading supermarkets, pharmacies and online at amazon.co.uk.